What is the train? And what else can be said about the picture, the scene, train etc etc? As always: What? Where? When? 4783 is the Loco Pub Co. number, not a Tidey number. I only know as this LPC version but suspect it is a Tidey picture. Location is Garstang so a bit north of the 1913 trip but not impossible. Only noted as an up express. Sadly there is no correlation between Tidey and LPC numbers and it is possible for pictures taken years apart to have adjacent LPC numbers. LPC numbering is a nightmare! Of the 5000+ Tidey pictures so far only 744 have been confirmed as being through the hands of LPC. Some remain as LPC whilst others have finished up in the Real Photographs "T" series where the bulk of the Tidey pictures now reside. Both Real and LPC are of course at York. The first vehicle is a Caledonian Railway 30ft 0in Covered Carriage Truck of Diagram 83, one of 20 built between 1906 and 1908. The second is a WCJS 45ft 0in Family Saloon to D.13. The remainder of the train is indistinct but appears to be WCJS 57ft 0in corridor stock, the third vehicle looks like a corridor brake composite of D.40, and the fourth is probably a corridor brake third of D.65. Probably the 10.00 am Euston-Scotland or a relief thereto. The line on the left is the Garstang & Knott End line and the view is looking north to Turners Bridge with Taylors Bridge beyond where the Knott End line swings away west. So this must be an up express. Garstang & Catterall Station is about a mile behind the photographer. �Probably the 10am Euston-Scotland or a relief thereto�. Hardly. 4783 is �noted as an up express� in the LPC list, and the train seems to be approaching Garstang from the north with the line to Knott End nearest to the camera. Slip of the keyboard, Ted. I can say with certainty that it is the 10.00am Glasgow to Euston, 12.18pm from Carlisle, scheduled to pass Garstang soon after 2.00pm. The second vehicle is a D.40 brake composite through carriage from Glasgow to Bristol. The third vehicle is a brake composite to D.39 (not a brake third as I said at first) from Glasgow to Birmingham. It is marshalled the wrong way round (with brake compartment leading) according to the Marshalling Circular. Then follows a 65ft 6in dining saloon. The eighth vehicle seems to be a six-wheeler of some kind but is too far away to identify. Was it usual to use 4-4-0 locomotives on such a heavy train over the Westmoreland fells? I would have expected a 4-6-0. Michael Bentley has another photograph at Garstang but showing a down express north of the bridge which is on the left in 211. The engine is 2222 Sir Gilbert Claughton and it still has its front buffer beam as originally fitted � with square lower corners � which dates the picture as pre-September 1913. The picture has no reference number on it, LPC or Tidey or whatever. Michael thinks the George the Fifth in 211 is No 1681 Ptarmigan. After talking to Michael, I then consulted Malcolm Lewis. He has the same photo of 2222 passing Garstand and says it was published in �Railway and Travel Monthly� Vol 9 1914 page 305 and that it was attributed to �H. G. Tidey�, the caption stating that it was a down express passing Garstang. John Alsop says he has a note that the train is a Manchester-Glasgow express and that the negative number is 4494. So this photograph and 211 both seem likely to have been taken by Tidey on the same visit to Garstang sometime before the autumn of 1913. A few years ago the Society acquired a few dozen half-plate prints of H Gordon Tidey photographs - I didn't know the proper numbers for the photographs (and these seem to have changed from time to time) so I placed them all into the 'HGT' collection and numbered them from 1 onwards. Mystery Photo 211 is 'HGT 16' in the Society photograph archive. HGT's number (on the back of the print) was 46 but that is crossed out and replaced by 251. The location is north of Garstang & Catterall, as stated by previous correspondents - there are several photographs taken by various photographers at the same place. There are some notes on the back of the print, in what is presumably HGT's writing. These state that the engine is No. 1031 RACEHORSE and that the train is an 'Up Edinburgh Diner', although they do not say where the train was heading. Pictures of 4-coupled engines north of Crewe are not unusual although 6-coupled are far more common. 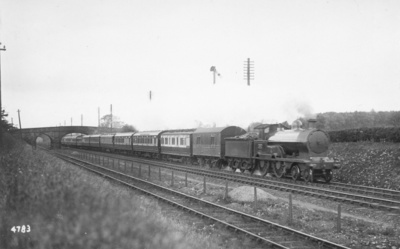 Some of the trains with 4-coupled engines are labelled as 'Lakes Express' so, unlike RACEHORSE, the engines would have turned off to Windermere at Oxenholme and not had to face Grayrigg and Shap. Many thanks to Norman for all the interesting and vaulable information on the Society�s Tidey photographs. Just one point � the correct number of RACEHORSE was 1631, not 1031, which possibly explains why Mike Bentley thinks the engine was 1681 PTARMIGAN. It would be very difficult to read the number on a print and 1631 would look very much like 1681. My October 1913 Marshalling Circular shows only one Manchester � Glasgow express, the 5/45 from Manchester, 6/40 from Preston. That would pass Garstang at around 7/00. I think it was taken a little to the north of the L&M bridge mentioned under No. 210 and looking south. If so, the chimney on the right belongs to Newton in Makerfield water works. Unfortunately HGT wrote nothing on the back of this print. There are two or three HGT pictures near Golborne junction, a little further to the north, and the countryside, fencing etc look much the same.as in this. It all seems to fit except for the bracket signal in the distance - if the site is where I think, it seems too far away from Winwick Junction to see even a splitting distant. The engine is No. 1631 RACEHORSE again - Ted Talbot is quite right about the number but HGT's note on the back of the Garstang picture (211) shows 1031 quite clearly. Perhaps he was mistaken about the origin of the train, too. Norman Lee refers to the Bracket Signal, near the Newton Waterworks. Too far away from Winwick Junction, however, a signal is shown on the 1925 revision of 6 inch OS map, at the position observed, but not however on the 1906 revision, where it shown marked, on the down side embankment. I guess this Bracket Signal is a distant signal in advance of the signals protecting Golborne junction, incidentally set for the fast down towards Wigan. from "select map type" choose 1:2500 then "enlarge view"
The fence has the purpose of defining the boundary between LNWR and G&KER territory. Contrast the size of fishplates on the main line with those on the independent branch. The chairs on the branch also seem less substantial.